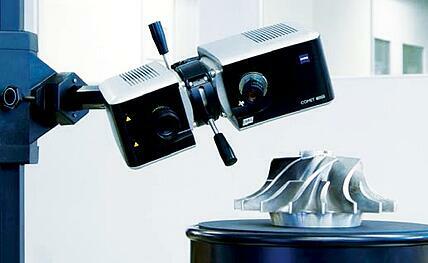 Dimensional inspection includes many types of scanning devices for a broad range of applications. In the realm of 3D Scanning, the level of detail that can be captured makes it the method of choice, especially for measuring very small objects requiring non-contact measurement methods. Whereas contact 3D scanners collect measurement data by physically scanning the object with a device that comes into contact with every point on the surface, non-contact 3D Scanners collect immense amounts of data quickly without altering the geometry of the object. This is also an advantage for collecting measurements on the nano scale. A confocal microscope uses a process called optical sectioning to collect images from various depths. These images can be reconstructed with a computer to create a 3D model of complex small objects. Unlike other laser systems, a confocal microscope only sees one depth level at a time, which allows it to generate a highly controlled depth of focus for very small objects with tight tolerances. This non-contact measurement system allows you to obtain surface measurements at the nanometer level. The technology behind white light interferometry uses wave superposition to measure distances based on data collected about reflected wave interactions. 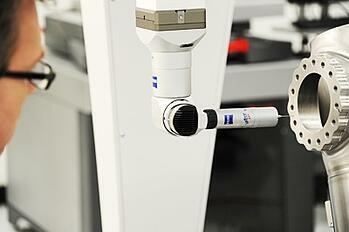 Interferometers can also be combined with microscopes to measure very small objects. Because they rely on the detection of waves and not optical images, interferometers are also useful for measuring objects with reflective surfaces. Like interferometry, chromatic confocal also uses white light to collect measurement data. However, whereas interferometry uses the superposition of waves after they are reflected off the object, chromatic confocal measures the wavelength as it hits the surface of the object. This method produces more reliable results when measuring surface roughness or step-height depth, due to the minimum mathematical calculation required. The tolerances of large objects may allow the use of a thin whitening spray to facilitate scanning but the geometry of very small objects could be potentially buried by it. Fortunately, all of these methods work well with various types of surfaces from reflective to absorbent. If you require any of these types of 3D Scanning methods, or if you're not sure what you need, the experts at Q-PLUS Labs are here to help. We'll work closely with you through every step of the process to ensure that you get the best results for your application. Contact us anytime if you have questions, or if you're ready to get started, call us today. California State University, Fullerton's Society of Automotive Engineers (SAE) chapter chose Q-PLUS Labs to aid them with the challenge to compete in the Formula SAE, a competition which encompasses designing, building, and competing a mini-formula style race car that will be evaluated for its potential as a production item. Fullerton's SAE uses a Yamaha R6 Motorcycle engine, a large displacement choice for the 610cc class. The car's design utilizes the R6 engine as a stressed member to connect the drivetrain to the cockpit. 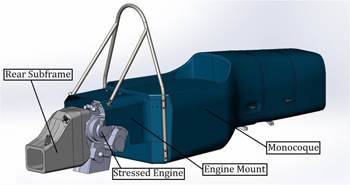 This type of engine design requires the chassis to work with the engine as an active structural element of the chassis to transmit forces and torques, rather than using standard anti-vibration mounts to passively contain it. The R6 engine was chosen based off its high power output and ability to be used as a stressed member. In conjunction with suspension design and tire selection, the engine weight works well to keel the tires while heated under the track's conditions. Because the race car's design is based on the integrity and precision accuracy of the engine's measurements, Fullerton's SAE sought the expertise of Q-PLUS Labs' dimensional inspection engineers. 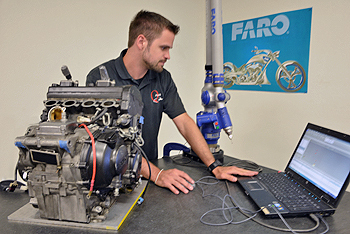 Using a Faro Arm CMM, Q-PLUS Labs provided a dimensional analysis of each mounting point for the engine. These points are integral not only to the race car's design but also to the safety of the driver. Given the engine's exact 3D measurements, Fullerton's SAE could confidently proceed with their design. They were able to retrofit and reverse engineer the chassis to properly fit onto the race car's engine. Currently in the manufacturing stage process, in a few months they will produce the assembled chassis to compete in the Formula SAE® Lincoln this June. 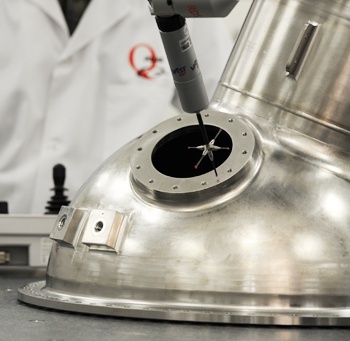 For some dimensional inspection applications, the best way to obtain measurements is by using a sensor that comes into contact with the object. Contact sensors work best when the object is rigid and not fragile. They are also often used when the surface of the object does not lend itself to light sensors because it is reflective or too dark. Coordinate measuring machines - Also known as CMMs, these mechanical systems use probes to measure the surface characteristics of an object. The physical measurements are converted by a transducer into electrical signals that are then analyzed by specialized software programs. Basic models provide XYZ readouts, while more advanced technology can work with CAD models and can be fully automated. CMMs are often used for first article inspection or quality control. Articulating arms - These are basically portable CMM systems that are not limited to the linear X, Y, and Z axes. 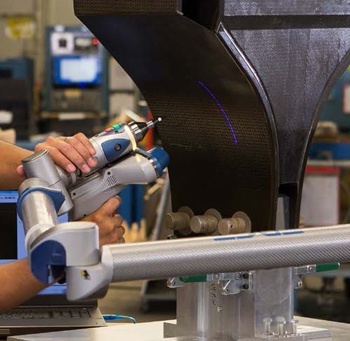 Because they can move on multiple axes of rotation, articulating arms are often used when the object has cavities or other geometry that limits the accuracy of a traditional CMM. They are also useful when an object must be measured in the field. Form and contour tracers - For small objects or those with very tight tolerances, form and contour tracers use a stylus with continuous contact on the surface to measure features such as edge radii, thread forms, roundness, and cylindricity. There are several other types of contact sensors, and even more types of equipment within each category. If you're not sure what type of equipment will produce the desired results, it's best to work with an experienced professional. Contact sensors do not work well for dimensional inspection when the object is soft, elastic, or extremely small. In these cases, non-contact sensors are generally the best option. Q-PLUS Labs is here to help you decide what type of dimensional inspection equipment makes the most sense for your application. To learn more, download our free guide, or contact us today to schedule a consultation. 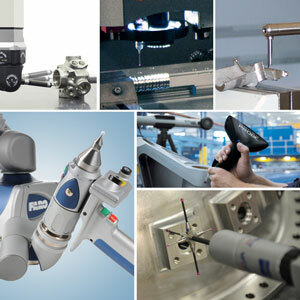 What type of contact sensor do you think would work best for your dimensional inspection needs?